These chips are suitable for filling the gap of packaging items of irregular shape materials like statues and machine parts to avoid damage. These EPS chips are Bio degradable, highly shock absorbent and light weight. Can be reused repeatedly number of times. In order to process high quality Thermocol Chips, our professionals employ advanced machines and utilize quality tested polystyrene procured from the authentic vendors. We offer these chips to our clients at a nominal price. 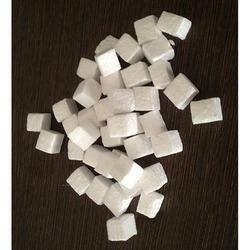 We are one of the prominent manufacturers and suppliers of Void Packing Material. Particles sizes are configured to pour freely and flow around any size or shape of an object placed in box/container. Hence, saves on custom packs & molds as it provides cushioning to all the shape and size of any article.It interlocks avoiding settling of the packing material when stacked & during transportation. Easy to use, no training is required for this perfect protective packaging material. Empty (Void) space tends to raise the temperature, hence advisable to be used for Cold Chain Packaging. Can be reused repeatedly a number of times. EPS void fill is not affected when humidity is in the air. Resistant to fungus growth, do not readily absorb moisture. various products available viz., dunnage void fillers, air bags etc. Looking for EPS Chips, Polystyrene Fillers ?